Hull FC win the Ladbrokes Challenge Cup after a second half comeback against Warrington Wolves, with the Airlie Birds lifting the Challenge Cup Trophy for the first time ever at Wembley Stadium. A thrilling encounter awaited at Wembley for this year’s Ladbrokes Challenge Cup Final, Warrington are no strangers to the Wembley stadium, with plenty of experience under their belts. Hull have been the surprise package of Super League this year, however, and make this their second Challenge Cup final in just three years having missed out in 2013 against Wigan Warriors. This was the first ever meeting between the two sides in a major final. An enthralling start to the game saw Hull come close, paired with some great work from the boot of Marc Sneyd to keep Warrington pegged back for long periods. The primrose and blues were quick to interrupt the Hull game plan though, and on 15 minutes looked as though they would break the deadlock as Kurt Gidley placed a neat ball towards the in-goal area, but Sika Manu made sure it remained scoreless. Warrington were gifted a great opportunity 24 minutes in after a knock-on 30 metres out. Tony Smith’s men looked to take advantage as quick hands from Kurt Gidley and Chris Sandow fed Ryan Atkins on the wing, the number four was held over the line and his searching offload rolled into touch, allowing Hull some breathing space. Warrington eventually opened the scoring on 33 minutes as Chris Sandow intercepted a straying pass from a black and white shirt to launch an 80-metre dash for the goal line. Jamie Shaul was on hand to stop Sandow finishing an almost perfect run, but with Hull FC still chasing it created an easy opportunity for Matty Russell to grab the first of the game. Kurt Gidley slotted over from a close angle to nudge Wire ahead at the end of a very close opening period. Just two minutes into the restart the pressure forced Hull to be penalised for holding in the tackle, Kurt Gidley immediately signalled for the two from a perfect position, looking to extend Warrington’s tally to eight unanswered points, but the ball sailed wide of the posts. Almost immediately Hull found themselves in a great position down the other end of the pitch. Scott Taylor provided a delicate touch to the corner, chased by Steve Michaels but Ratchford smothered it just in time to prevent a certain Hull try. The resulting drop goal was enough for Hull to power forward once again, this time Carlos Tumavae just short of the goal line, but the Warrington defence were equal to the attack and the score remained 6-0. As Hull looked to be closing in on an important comeback, Warrington made an important break to take their tally to 10 after 55 minutes, as great team play from right to left allowed Ben Currie to power into the corner for the Wolves, with Gidley missing the conversion. With Hull desperately needing a foothold in the game, Marc Sneyd rescued some vital territory on the hour mark with a 40/20. It was exactly the lift the Airlie Birds needed as Scott Taylor was narrowly held over the line before Sneyd turned creator again with a perfect chip cross-field to allow Fonua to touch down in front of the black and white supporters. The boots of Marc Sneyd squeaky clean to complete the move with the conversion to reduce the deficit to just four points. In just a matter of minutes Hull were overcome with a burst of energy. Marc Sneyd looked to set up Steve Michaels for an equaliser in the corner but a second opinion from the video referee confirmed Stefan Ratchford had just got there in time to deny Hull a score. On the 73rd minute it was apparent that Hull were here to cause and upset after fantastic play, again from Marc Sneyd, fed Jamie Shaul crashing under the sticks in front of a loud and jubilant Hull FC end. The conversion from directly in front of the uprights was successful from Sneyd as the Airlie Birds edged ahead with seven minutes to go. With just over a minute left, Warrington looked like they might have snatched the victory from the grasp of Hull, but Ben Currie knocked on just before managing to ground the ball. With Warrington pinned back deep inside their own half, dreams became a reality for Hull as the final hooter sounded, confirming the Yorkshire sides’ first Wembley Challenge Cup win. Hull FC – 1. Jamie Shaul, 19. Steve Michaels, 2. Mahe Fonua, 24. Kirk Yeaman, 5. Fetuli Talanoa, 3. Carlos Tumavae, 7. Marc Sneyd, 8. Scott Taylor, 9. Danny Houghton, 10. Liam Watts, 21. Sika Manu, 12. Mark Minichello, 11. Gareth Ellis (c) Replacements – 22. Josh Bowden, 23. Frank Pritchard, 30. Danny Washbrook, 15. Chris Green. Warrington Wolves – 6. Stefan Ratchford, 5. Matty Russell, 24. Toby King, 4. Ryan Atkins, 3. Rhys Evans, 1. Kurt Gidley, 7. Chris Sandow, 8. Chris Hill (c), 9. Daryl Clark, 10. Ashton Sims, 11. Ben Currie, 12. Jack Hughes, 14. Joe Westerman. Replacements – 18. George King, 16. Brad Dwyer, 13. Ben Westwood, 33. Ryan Bailey. The number of dairy products sold in the UK has seen a decrease of over 4% in the last 5 years, as numbers have dropped from 101million products to just over 98 million since 2011. The numbers have seen a steady decline, as prices on dairy products saw a significant increase. Cuts to the price paid for milk caused mass protests from dairy farmers across the UK, who took to targeting supermarkets and clearing the shelves of milk cartons in what has been dubbed the “Milk Trolley Challenge”. Although they did not participate in the “Milk Trolley Challenge”, Mrs. Kirkham’s Lancashire Cheese has been hit by the decline in dairy sales. The producers of homemade Lancashire cheese, which stocks the likes of Harrods, Booths and Waitrose, find themselves producing a slightly smaller number of produce, owing to the decline in sales. The production of the cheese at Mrs. Kirkhams starts from milking their own herd of cows, adding whey, milling the cheese and packing ready for selling. The family run business has been making their own branded cheese for 38 years, and are now up to the third generation of Kirkham cheese makers. These photographs show us a few stages of how this Lancashire family make cheese, from the cow to the finished product. Each process is lengthy and sometimes tedious, but it is all a part of the Lancashire heritage and what makes Mrs. Kirkham’s such a popular choice. They are willing to make the changes to get dairy sales back on the rise, taking their produce to independent businesses and even food festivals in their spare time. Their breakout into both local and National supermarkets and shops has shown their desire to keep dairy sales steady and that there is still a market for homemade products, not just mass production foods. All available to contact at 01772 865335. On my 20th birthday this year, I received one of the best presents I could have wished for, the chance to pitch to the top bodies in the Journalism industry. Choosing to take the broadcast option in my third year at university allowed me to narrow down who I wanted to pitch to in order to gain some experience in my chosen field. I won two placements on that day, what a birthday! 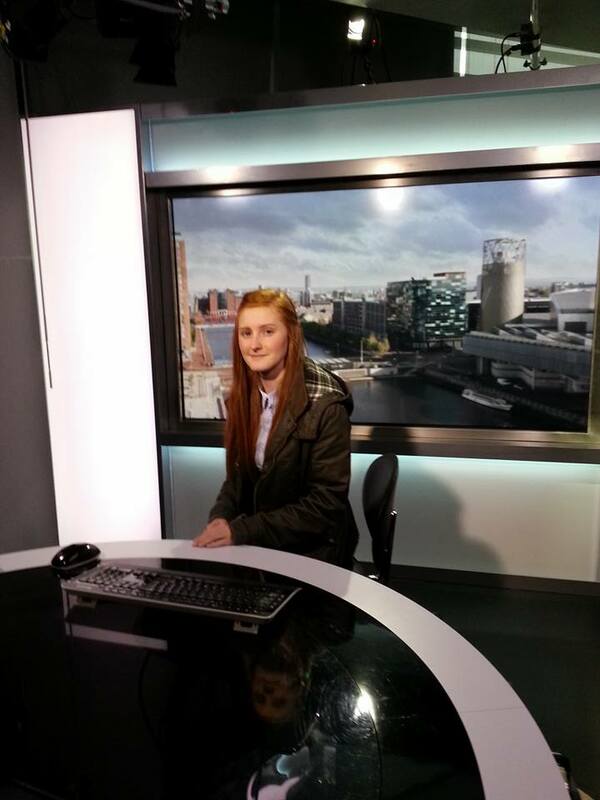 The first was to spend the day with the BBC North West Today/ North West Tonight team at Media City in Salford. 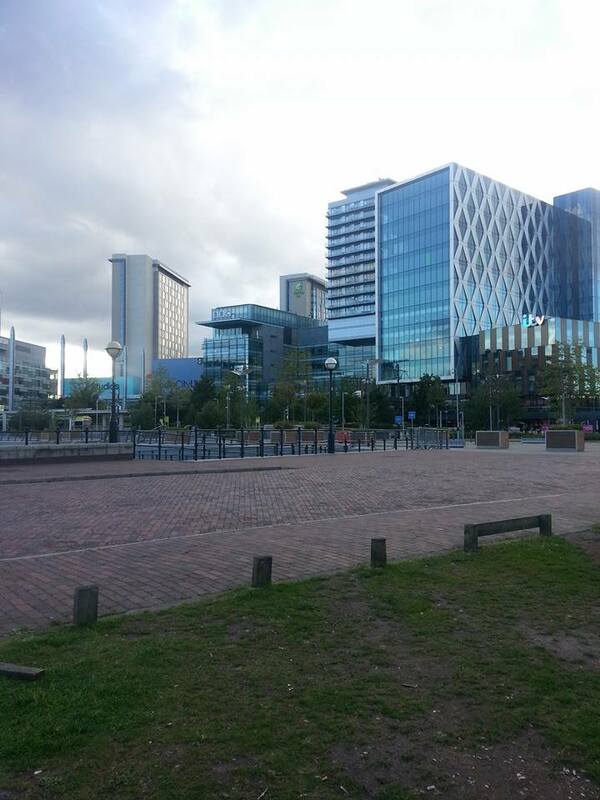 I made the trip on May 29, my first trip to Media City and it did not disappoint. I cannot express the feeling you get when you walk towards the collection of buildings, absolutely breath-taking. I was given the tour of the BBC building on arrival, work in full swing on every floor. I was surprised to see how small the TV studios where the news is filmed are, especially in comparison to the large packed newsrooms. It was good to see how close each section of the newsroom were to each other though, making it a good working relationship between i.e. the editors and reporters, where they are never too far away from each other. For the first part of the day I shadowed one of the reporters, getting to see the hard work that goes in to putting the pieces together for the lunchtime news. It was a day when Jermaine Beckford replaced a shirt for a young Preston North End fan and Court reports came in from the Heysel stadium disaster. After seeing some of the packages being put together I then got to sit in the gallery to witness the dinnertime news be broadcast in the North West. It was not my first experience in a TV gallery but you forget how noisy it gets with the PA shouting numbers and the director shouting numbers over the top of that, you have to admire the presenter for being able to cut out the background noise. The afternoon consisted of shadowing a video editor, I found this the most valuable part of the day and it was amazing to see how quickly and precisely she was able to edit a package together. I consider editing and vision mixing one of my stronger assets, with what I thought was a good hand at editing, but seeing the work of the editors in the business I got an insight of how far I still have to go. I think it was a good wake up call, however. Overall, my day at BBC North West tonight absolutely flew by. It was a good experience though, seeing the pressures and hard work of the news room and the hectic nature of the gallery and the handiwork of the editors. The first semester of my Second Year has literally been one of the most hectic periods of time in my life so far. Deadline after Deadline has fallen in front of me and I’m now down to my last 4 deadlines before the elusive and much needed Christmas break. I’m slowly getting there, doing little bits of each assignment here and there, not only to keep my sanity during this busy time but because I feel like I want to give up with some of them. Unfortunately, I can’t just give up, otherwise I guess I won’t be graduating with any sort of degree in 2016, well, unless they make Procrastination a formal university degree. So, to also help keep sanity as nearby as possible I’ve been taking small bits of time out with friends and family. I heard a statement by a lecturer last week which said they’d expect to see “hungry and enthusiastic journalists” and in one sense I certainly am. I’m a trainee journalist who is certainly hungry…and enthusiastic, about food! I spend a lot of my time off and my hard earned cash on fine dining. The last few weeks I’ve eaten out a lot, I like to spend my free time going out for food, because I’m rarely disappointed by restaurant standard food and it makes me happy that I’ve eaten well. I went to London, as you may have read in a previous blog. As I also like to spend days off out and about, rather than wasting a day being sat indoors. I aim to go to the Christmas Markets in Manchester for my next outing, so you can look forward to a blog about that. Finally, I spend a lot of my time watching Sports. I follow Wigan Warriors Rugby League and Liverpool FC and a big proportion of my monthly earnings go towards watching them. I’ve just renewed my Wigan season ticket and I’ve spent over £350 on tickets to see Liverpool this season. So, I’m getting towards the end of my workload of assignments before the Christmas break. I’m hoping to spend my time off doing the things mentioned above so it won’t come as any surprise to you if you see posts entitled ‘Liverpool’ or ‘Christmas charisma’ or something along those lines. Happy Halloween to everyone on WordPress, I hope you all have fun dressing up tonight and aren’t too harsh on those Trick or Treater’s! Tonight I’ll be hitting the town as Ginny Weasley, hopefully I’m not just recognised as a ginger girl in a Gryffindor T-Shirt, but we’ll see how that goes. So my second Video Blog is up right now! Also if you aren’t sure who Wigan Warriors or Warrington Wolves are, their game will be live on Sky Sports on Friday if you’d like to watch a game of Rugby League. Personally, I think it’s a fantastic sport and we always love welcoming new fans to the sport!